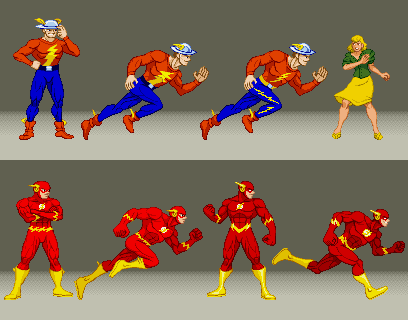 The first batch of these were made during Flash week, a theme on both Illmosis and ScrollBoss celebrating the 75th anniversary of the Flash (starting with Jay Garrick. I started working on a running animation with some hand-drawn and scanned frames, but realized that I should probably do more of it digitally for consistency reasons. The animation still isn't done 100%, but the "final" version will show up in a future project. There was going to be a pixel art re-creation of the Flash Comics #1 cover (the Jay and Joan sprites are shown here), but, figuring most people would want more sprites, I stopped working on it to add more villains. Barry's look is based on the look and part of the palette I used in the Capcom-based sprites I edited from Cyclops years ago. 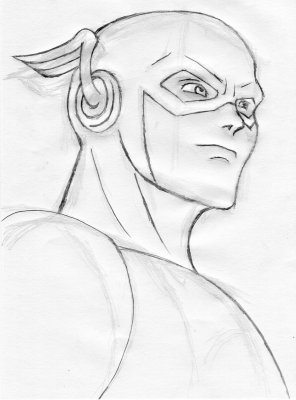 Wally is based on his Justice League/Justice League Unlimited look and his first standing pose is based on his Justice League Task Force (SNES) win-pose.